Looking for pie recipes? 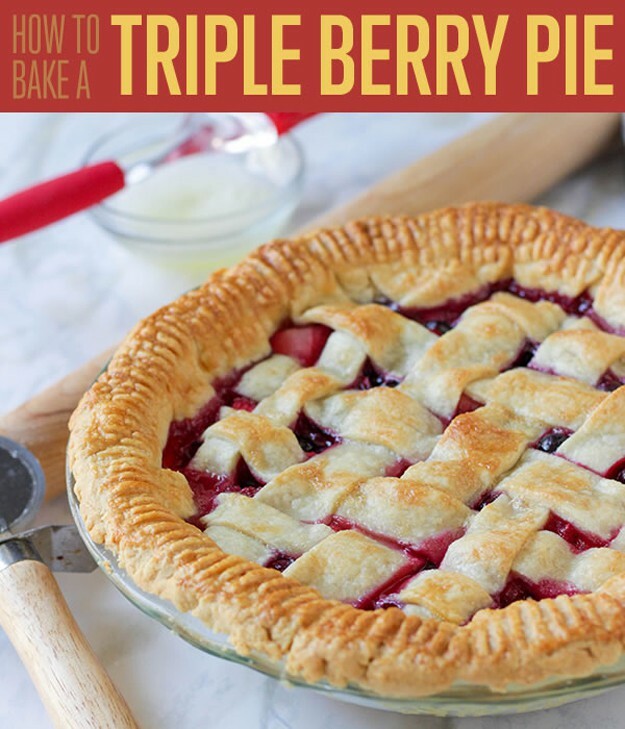 If you want some dessert recipes you can try and serve to your family, make this triple berry pie. It's a great dessert idea anyone will love. Baking pies can be intimidating if it's your first time making one. I've also had my share of baking fails but it never stopped me from trying to bake one. The challenge I've had was with the pie crust. But after several tutorials and thanks to the food processor I got as a gift, I know that I would be able to overcome this challenge and bake the best pie! Yes, you can use store-bought pie crusts but for me, it's just not the same. I had to know how to make one and with the pie crust recipe I've made, you can know whip up an amazing pie crust in less than five minutes! So if you're a berry lover like me, why don't we start making this delicious triple berry pie. For the pie glaze, you’ll be using 1 egg white and ¼ cup white sugar. Make your pie crust by following my easy pie crust recipe. Multiply the ingredients x2 since we'll be needing more for the lattice. Since my food processor is smaller, I can only make one crust at a time. If yours has a larger capacity, you’ll be able to make both at once! Pie crust recipe here! Once the blueberry mixture has cooled to room temperature, mix with the strawberries and raspberries. Now you can set it aside until we’re ready to fill in the pie shell! And now, the fun part! Lattice crusts look intricate, but they’re actually pretty easy. Peel each individual strip from your parchment paper and across the top of your pie. I chose five strips so that the berries underneath were still visible; you can use more if you’d like a tighter lattice. Just make sure that you end up with an equal amount–if you want to use 6 strips, make sure you have 6 strips left on your parchment paper to be placed in the other direction. Roll every other strip back onto itself–you don’t need to roll them back all the way! Just enough to provide leeway for the start of your lattice, as shown below. Then, place your first perpendicular strip at the edge and over the other strips that are still laying over the edge. I know this sounds confusing, so I’ve provided a close-up image for clarification. Repeat the last two steps until you’ve achieved a full, covered lattice. See–that wasn’t so hard! Like I said before, measure your strips so that you don’t end up with uneven ones like mine… it’s more obvious when you finish the lattice pattern, so it pays to be exact. Gently pinch the overlying lattice crust with the bottom crust, then roll the slack underneath the bottom crust. You want the lattice to seamlessly run into the outside crust, like seen above. Using a fork, press the prongs into the crust to form a ridged pattern. This part is optional, but I love the way it looks–I think the texture makes the pie look so cute! Remember how I mentioned a pie glaze at the start of this recipe? I know, it was a long time ago… again, we need 1 egg white and ¼ cup white sugar. Take the egg white and whip it with a fork until it’s frothy, then brush the egg white onto the crust with a pastry brush. Sprinkle the sugar on top of the crust. You may or may not use the entire ¼ cup–it’s at your discretion. The egg white will make the crust glossy, but the caramelizing sugar on the top of the crust is what gives it that glossy, caramel color. Place your pie in the fridge for 30 minutes. We’ve worked with that pie crust for a long time! It needs time to rest and firm up before being baked. Once you’ve placed your pie in the fridge, set the oven to 350ºF and allow it to pre-heat. Once 30 minutes has passed, place your pie in the center of your oven rack and bake for 45 minutes. Be sure to check on it at 30 minutes–if it looks like your pie crust around the edges is baking much faster than the rest of your pie, tent the pie with aluminum foil. Once the crust looks golden-brown and the amazing smell of berries is mouth-watering, take your pie out of the oven and let it cool completely (to allow the filling to set) before digging in for a slice. Let it cool then dig in! I know that all of these steps seem arduous–and pie looks like it’s a lot of effort. But once you start getting the hang of it, making your own pie crust is a snap. 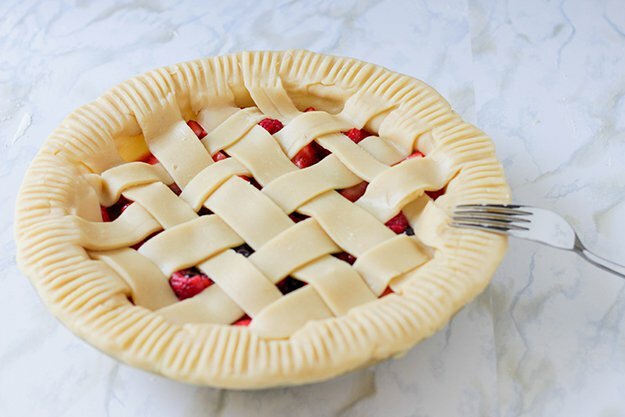 The best part is that you can make pie crust in advance; you can store unrolled pie crust for up to 2 days in the fridge and for a few months in the freezer! So you can have pie at your convenience, so long as you have the patience to roll out the dough. And considering how much tastier pie crust from scratch is… don’t you think it’s worth the effort? Did you our triple berry pie recipe? Let us know in the comments section below what your thoughts are on this pie recipe. Do you have any other recipes you’d like to share? Share it with us and we’ll give it a try. We love doing cool DIY projects by making craft projects, home decor projects, upcycling ideas, recipes, tutorials and anything you can do yourself. That’s why we created this site, we want people to be more in touch with their creative side and realize that there’s a lot of things that they can do themselves. We’d love to hear from you and create a community of DIY enthusiasts where any project is just a click away. Stay connected with us on Facebook, Twitter, Pinterest and Instagram!